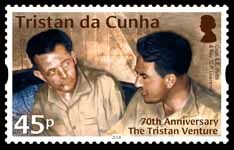 Stamps celebrating the 70th anniversary of the South African scientific survey expedition that led to the establishment of the Tristan Rock Lobster fishing industry. Not for nothing was the tiny British overseas territory of Tristan da Cunha known in the early 1940s as the loneliest island in the world. Ships rarely called, the residents had no need of money, which meant of course that even issuing stamps was pointless. Then came the Second World War, and by 1942 the Royal Navy had arrived to establish a significant meteorological station on the island. Paid work was on offer, and British currency began to circulate. Tristan's long-standing struggle against hunger and deprivation had been halted, and with the departure of the military many islanders found themselves questioning the previous impoverished nature of their lives. Amongst those stationed on Tristan during the war was a naval chaplain, Rev. C. P. Lawrence. A merchant seaman prior to his ordination in 1936, he shrewdly recognised that the island-group had potential for providing stability and self-reliance for the Tristan people through the responsible exploitation of their marine-food resources. In the years that followed Rev Lawrence lobbied a group of powerful South African fishing companies, secured the support of the Colonial Office in London, and organised a scientific expedition with the primary objective of considering the practicality of setting up a fishery industry on Tristan. 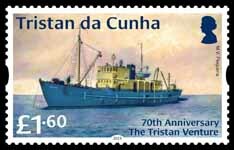 Central to the venture's purpose was the decommissioned minesweeper MV Pequena, a vessel so small – she was only 36 metres long – that it is amazing she was considered safe enough for the long round-trip from Cape Town let alone the additional visits to Tristan's archipelago. Master of the ship was Capt. L. E. Pettit, and on 6 February 1948 he and his crew finally sighted the volcanic cone of Tristan. On board were the eleven members of the survey-team, a line-up that included Rev. Lawrence as its leader, three marine biologists, an agriculturalist, a physician, and two engineers. For thirty days the scientists carried out their detailed investigations. As the published reports later reveal, the agriculturalist explored the feasibility of introducing new farming methods into the tiny community, while the medical doctor evaluated the shortcomings in the islanders' diet at the time; but far and away the most significant discoveries related to the possibility of establishing fishing as a commercial enterprise. Here was the breakthrough, for amongst the reefs of kelp-weed surrounding the islands' coastlines the marine biologists found vast stocks of Tristan crawfish amazingly easy to catch and in sufficiently abundant numbers to be a sustainable crop. Jasus tristani is a crustacean notable for having no claws but possessing a large fan-shaped tail packed with succulent meat. Even at that stage North America was identified as a lucrative market for this tasty delicacy. So, the venture can rightly be described as a remarkable success – though it came at a dreadful cost. To this isolated community with little immunity against infectious diseases the expedition-team unwittingly brought a particularly severe strain of influenza which tragically resulted in the deaths of a number of the islanders. Back in South Africa the commercial backers recognised that the project was viable and strategic planning began in earnest. The Pequena was fitted out with a refrigerated hold for the immediate freezing of crawfish tails, and by the following year construction had started on a canning factory on the edge of the island's settlement. 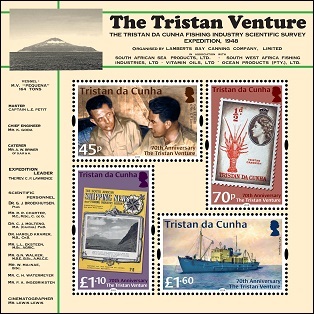 The Tristan da Cunha Exploration Co. was formed, straightaway receiving a vital guarantee from the Colonial Office of sole operating rights for fifteen years, and thus began an industry which to this day exports sizeable quantities of Tristan Rock Lobster to profitable markets right across the world. A new era of prosperity had opened for the people of Tristan. No longer were they reliant on the unpredictable appearance of ships bringing charitable gifts. Opportunities for employment on fishing-trips and in the processing factory were now available, money replaced barter, and a non-profit store was established where islanders could spend their wages. Under the terms of the concession the Company provided a doctor, a nurse, agriculturalist and additional teaching support from the outside world. 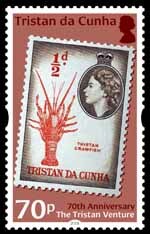 By 1952 Tristan had its own stamps, and in 1953 it exported over 27,000 ten-kilo cases of frozen lobster tails. The transition inevitably proved challenging, but the prizes were worth the effort: higher standards of living and comfort for all and, for the first time ever, the wherewithal to participate in world trade. 45p - Captain L.E.Pettit and Rev.C.P.Lawrence, the leaders of the survey expedition. 70p - A 1954 ½d stamp showing a Tristan crawfish, Jasus tristani. 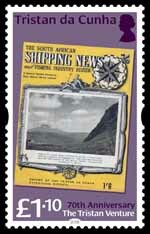 £1.10 - Front cover of a South African shipping magazine in which the Venture was reported. £1.60 - MV Pequena, the Venture's ship. 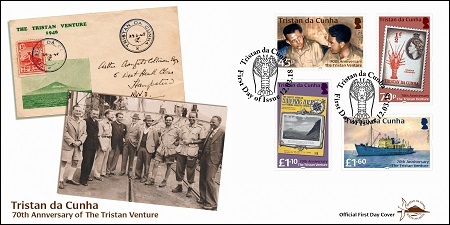 FDC - A cover sent by the Venture from Tristan (with a potato stamp), and a photo of the Venture team. Sheetlet - The background is the letterhead used for the Tristan Venture's stationery.